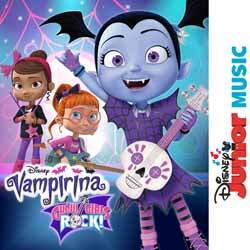 For young fans of Disney's Vampirina, this soundtrack will be a welcome addition to your music library. Obviously, like the show, the album is aimed at young girls. The songs are catchy, memorable and fun... but at only 7 tracks (10 min, 15 sec) the party is over before its even started. The upside is that if you have to have this on repeat, listening to it over and over again (because that's what the little one wants) it won't drive you loopy, as these songs can be enjoyed just as much by adults. Overall a fun, if somewhat short, collection of songs from the show. 6. Transylvania, Here We Come!